HOPE-A participated at the Printed Electronics Meeting organized by its business partner Afelim - the French Printed Electronics Association. 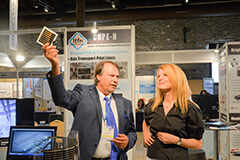 The day's focus was on the latest advances on Printed Electronic Sensors. The two associations strengthened their ties bringing their members closer to joint business ventures. The HOPE-A – IAPE (Innovation Alliance of Printed Electronics of China) Joint Workshop on Organic Electronics took place on 2nd of July during ISFOE at NANOTEXNOLOGY 2018 and was a success! HOPE-A and IAPE members presented the current state of technology and their entrepreneurial activities in Greece and China and discussed on upcoming knowledge exchange and collaborations. HOPE-A and its counterpart in China IAPE (Innovation Alliance of Printed Electronics of China) are organizing the HOPE-A – IAPE Joint Workshop on Organic Electronics during ISFOE at NANOTEXNOLOGY 2018 on Monday 2nd of July! 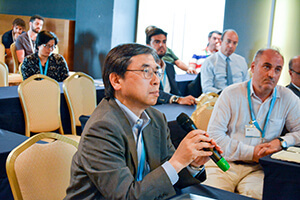 The Workshop will present the current state of technology and entrepreneurial activities of the Associations' members in Greece and China on Organic and Printed Electronics nano-materials, devices, equipment, precision metrology tools, manufacturing processes, integrated systems, products, for applications in Energy, Lighting, Electronics, Automotive, Healthcare, 3D printing, Wearables, IoT, to name but a few. The goal of this Joint Workshop is to promote Networking, Joint Ventures and Business between members of HOPE-A and IAPE. The collaboration between the two Associations makes up for a main driver for the advancement of the Cooperation between Greece and China in Technology, Innovation and Business. Do not miss it! Korea Printed Electronics Association (KoPEA), formerly launched as Korea Printed Electronics Council in 2008, started its business to boost the development of the printed electronics industry based on collaborations between industry, academy, and research institution, which would become one of the world leading industries and new growth engines in Korea. 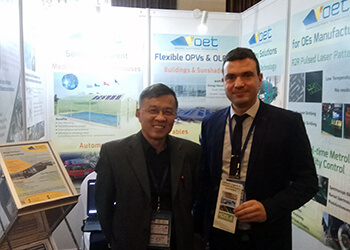 Our members Nanotechnology Lab LTFN and OET - Organic Electronic Technologies with our partners from Korea (KopeA) at the International Conference on Flexible & Printed Electronics 2018 (ICFPE). 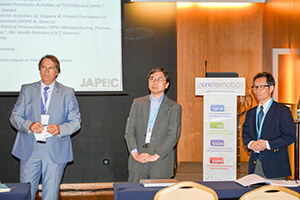 KoPEA, the Korean Printed Electronics Association, is now an official partner of HOPE-A. 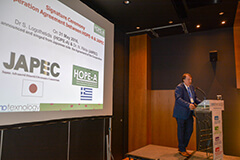 The two Associations signed a Collaboration Agreement on Friday 6th of July, at Porto Palace Hotel in Thessaloniki in the framework of NANOTEXNOLOGY 218, connecting their members with the scope to actively cooperate in common projects and push forward the Printed & Flexible Electronics field. KoPEA coordinates more than 120 entities, encompassing Printed Electronics global leaders, such as SAMSUNG display and LG display. This is the sixth Collaboration Agreement HOPE-A signs with an international partner, following the MoUs with AFELIM (France), oes (Germany), COPT.NRW (Germany), JAPEC (Japan) and IAPE (China). Nano|Net is an initiative for the promotion of communication and collaboration between research and business organizations activated in the fields of Nano-Bio-Technologies. Its' main purpose is to reinforce and promote Nanotechnologies in Greece, Europe and Worldwide, through an interscientific approach. Nano|Net started in 2003 from Nanotechnology Lab LTFN - AUTh, counting more than 600 individual members (~1300 cluster members) worldwide (including University Labs, Research Institutes, Companies, Hospitals etc.)! 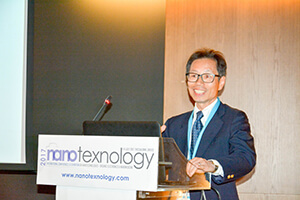 Moreover Nano|Net organizes the annual NANOTEXNOLOGY multi-events, one of the biggest technology, networking and matchmaking annual event in Europe. Nano|Net is an International Network with multidisciplinary and polythematic role, aiming to merge the existing expertise and knowledge between the rapidly growing fields of Nanotechnologies and NanoBiotechnologies. This network was founded on October 6th 2008 by seven companies and three research institutes from the organic sector in order to strengthen the organic center in Saxony and global. During ROleMak's 6th Workshop, Prof. S. Logothetidis (HOPE-A) and Dr. D. Gronarz (OEs-Saxony) signed the agreement of the Cooperation. Below you can see some photos.